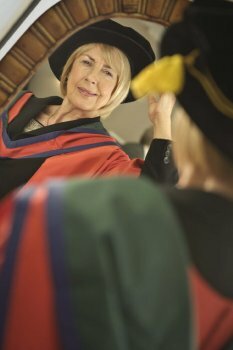 The 2012 Winter Graduation season continued at the University of Ulster’s Jordanstown campus todaywith the conferral of the honorary degree of Doctor of Letters (DLitt) on Rosemary Kelly OBE, in recognition of her sustained and exceptional leadership in the field of arts and culture. She is also being recognised for her contribution to the work of the University, having served with distinction as a member of Council for the past decade. Chairman of the Arts Council of Northern Ireland from 2003-2011, Rosemary is a former Head of Public Affairs and Secretary for BBC Northern Ireland. Other organisations she has championed include Ormeau Baths Gallery, the Ulster Orchestra and the Association of Ulster Drama festivals. Rosemary was also a founding member of the Irish Film and Television Academy. Until recently Rosemary was Chairman of Help the Aged Northern Ireland and also a Trustee of the charity’s London-based international board. Her current roles include Chairman of the British Council in Northern Ireland and Governor of the Irish Times which she joined in 2005. Rosemary Kelly has made a significant and sustained contribution to the arts and culture in Northern Ireland for many years and has championed a number of important causes. She was awarded an OBE in January 2009 for services to the arts. "Northern Ireland has been, and continues to be, a cradle of considerable creativity, boastingsome of the finest actors, writers, visual artists and musicians in the world, many from this University – including especially our own chancellor, James Nesbitt. "But we should think of creativity in its widest sense, thinking of those unsung heroes, entrepreneurs, inventors, investors , risk takers and visionaries on whom so much rests as we seek to rebalance the economy. "All these people have the power to make the world talk about us for all the right reasons – and they can, within their spheres of activity promote and image of a confident and creative place in which to live, work and do business. "During difficult economic times," she said, "there can be a temptation to regard the arts as a luxury: so it is vital to keep reminding ourselves that art matters, because it enriches the lives of everyone, regardless of their circumstances. "Art is a basic human need, and therefore a basic human right: art is one of the basic ways we can understand things with our hearts when we cannot get our minds around them." Tuesday's two ceremonies at Jordanstown saw students from the Ulster Business School receive their awards.